Durango City Engineer Gregg Boysen describes the reconstruction of the Santa Rita Water Reclamation Facility. He is standing next to the aeration basin, a massive structure, where micro-organisms will digest waste. The basin will be completely underground when complete. Warm weather has helped keep construction at the Santa Rita Water Reclamation Facility on schedule. The reconstruction of the plant is expected to be complete in 2019. Work continues on the Santa Rita Water Reclamation Facility as seen on Tuesday from Smelter Mountain. 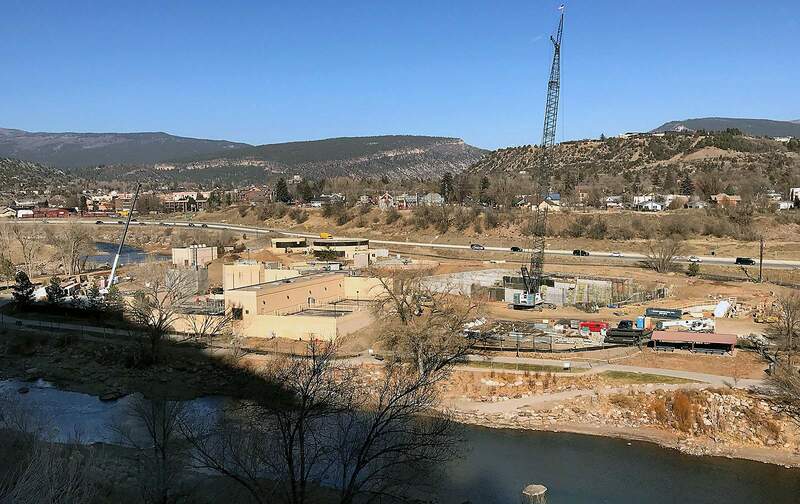 The largest construction project in city history, the Santa Rita Water Reclamation Facility, must improve the quality of water returning to the Animas River by March to meet state regulations. “We’re trying to get the water back to its natural state,” City Engineer Gregg Boysen said. The multi-million-dollar construction project was designed to remove more nutrient pollution from the water and increase the plant’s capacity, he said. New carbon filters are also planned to eliminate the infamous and sickening smell that sometimes permeates Santa Rita Park. The city is eight months into a 24-month construction schedule, and, thus far, the project is on time and on budget, he said. 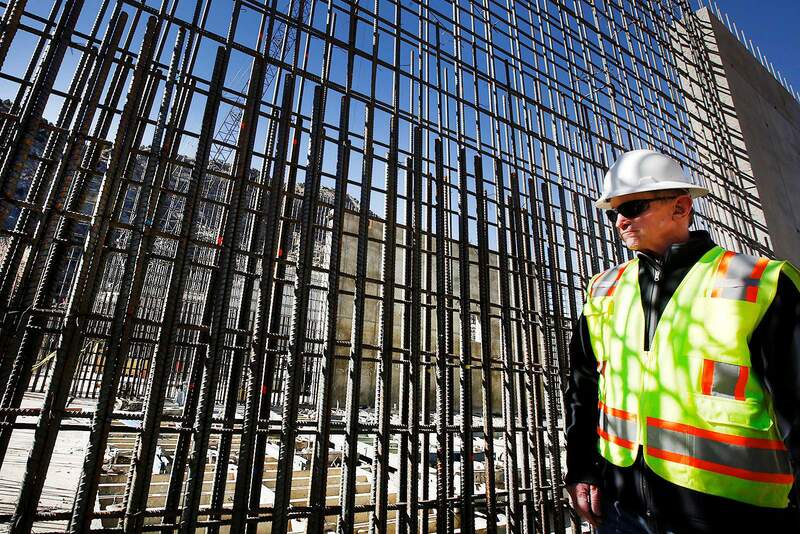 The first two major components of the plant – the aeration basin and the blower and chemical building – are scheduled to be finished in March. Those systems will remove nutrients to keep the city in compliance with state regulations, Boysen said. Heightened levels of the naturally occurring nutrients, nitrogen and phosphorous, can cause algae blooms that reduce oxygen in the water and kill fish, according to the Environmental Protection Agency. “Some algal blooms are harmful to humans because they produce elevated toxins and bacterial growth that can make people sick if they come into contact with polluted water, consume tainted fish or shellfish, or drink contaminated water,” the Water Quality Control Division of the Colorado Department of Public Health and Environment wrote in an email. Coming into compliance with the rules to reduce nutrients is costly. The city contracted Archer Western to upgrade the sewage treatment plant for $54 million and set aside an additional $5 million to cover unforeseen costs, Boysen said in an email. As of late December, the city had spent about $500,000 of its contingency fund, he said. “There are always unanticipated issues or unknown conditions that require modifications to the original contract,” Boysen said. In 2015, voters approved $68 million in debt to fund the plant and additional sewer infrastructure improvements. To pay off the debt, residents saw three years of double-digit sewer rate increases. In January, rates go up another 3 percent, bringing the average city resident’s monthly sewer bill to $49.94, or about $599 annually. Those who live outside city limits but are connected to the city’s sewer services pay double. Driving by Santa Rita Park, residents can see some of their money at work, as workers build a new aeration basin, a massive concrete tank where micro-organisms will consume waste. The city removed 2,200 dump truck loads of dirt to accommodate the basin, which will hold about 3.6 million gallons of liquid. The dirt was taken to C&J Gravel in Durango, where it was processed to be used in roads and foundations, Boysen said. “It was a close haul, and it was fairly economical for the contractor to do it that way,” he said. The new basin is about four times larger than the existing one. The entire basin will be underground when complete. Adjacent to the aeration basin, crews are working to complete the blower and chemical building, needed to pump air into the basins for the micro-organisms. The city is adding an additional digester building, where sludge is processed. The digester will allow the city to produce twice as much methane, which is turned into electricity for the plant. Inside a new dewatering building, rotary presses will separate liquids from solids and create new dry-packed product that can be hauled to landfill. Currently, the city produces eight tanker trucks of wet waste five days a week. By producing a dry cake material instead, the city will produce only one dump truck of material each week that will be taken to the landfill, Boysen said. In this process, more treated wastewater will be returned to the river. The city planned to start making fertilizer out of the waste, but it seemed unlikely there would be enough regional demand for all the fertilizer the plant would produce, Boysen said. At the same time, producing the fertilizer would have required additional equipment, energy, manpower, storage space for the material and an additional building. “The decision was to not expend the additional upfront equipment funds and future energy, maintenance and manpower cost for an extremely small benefit,” Boysen said. 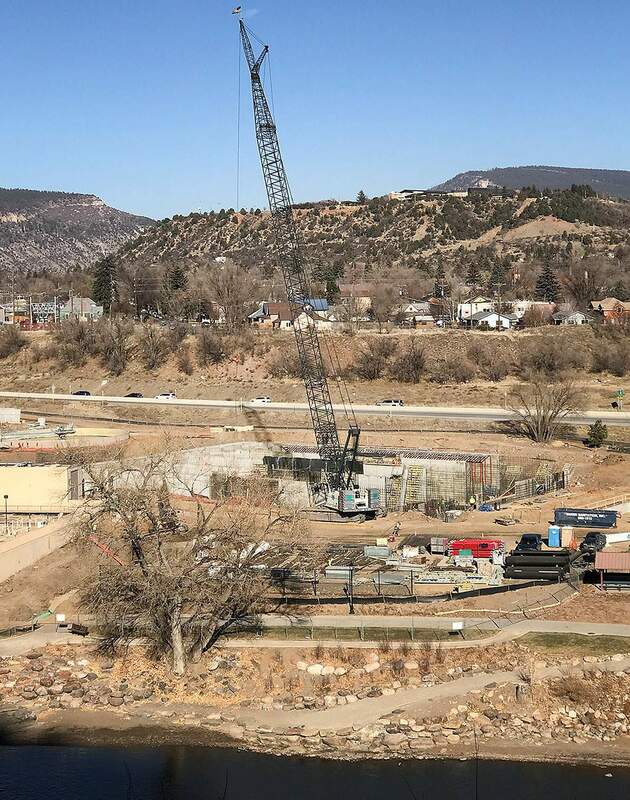 Construction will progress near the end of the site, where the city will replace the sludge storage building – where raw sewage flows into the plant, Boysen said. Six new buildings and five structures, including the aeration basin, are planned as part of the plant. The work will increase the capacity of the plant from 3 million gallons a day to 3.4 million gallons, Boysen said. There is really not a whole lot of growth potential in the plant’s service area and the focus of the upgrades is on increasing the quality of the water released from the plant, he said. The dry weather has helped the city maintain its schedule; a winter shutdown is not planned. “Snow won’t stop us,” he said. Construction of a new administration building will follow work on the new plant. Once work on the main plant is finished, the city plans to redevelop Santa Rita Park, which has been encroached upon by the new plant. The city may start to hold meetings on the redevelopment of Santa Rita this winter, but it has not yet set a schedule, Parks and Recreation Director Cathy Metz said. The city wants to know if the community is interested in restoring the park to its previous state or putting in new features or equipment. “I think there will be lots of great ideas that we will get from the community. ... We’ll just let that process unfold,” Metz said.